I used to work for a company that didn’t grasp the concept of guilty pleasures. In fact, there was such a snobby food culture that nobody would admit to ever having even been to a McDonalds. And of course nobody would ever admit to using a shortcut in their cooking. Well I wanted to spend this month writing about those things that you may be ashamed to admit to liking, but shouldn’t be. At bartlett mitchell, we have a reputation we pride ourselves on which is all based around fresh, beautifully prepared food. We ban ready-made salad dressings, packet sauces and cake mixes. We audit the amount of frozen foods in use to ensure that all our sites are getting the best produce and treating it with the respect it deserves. It’s healthier, tastier, and it ensures our chefs are in touch with the skills that seem in such short supply right now. But that doesn’t mean we are not allowed to like things which don’t quite fit in with that ethos. I remember when I first interviewed with bartlett mitchell, I was slightly wrong footed by strange questions like… “Do you like Marmite?” and “What’s your favourite cheat?” But it was the “What is your guilty pleasure?” question that really caught me out. I had assumed it meant guilty from possibly a health perspective. I think I said Pizza. It was only after I’d joined that I learned that they meant something that you would potentially be ashamed to admit. Wendy Bartlett used herself as an example. Wendy loves Fray Bentos pies. Now, there are a lot people in our industry that would never admit to that. They would think that it somehow diminishes their reputation as a foodie. The fact is, it has nothing to do with that. 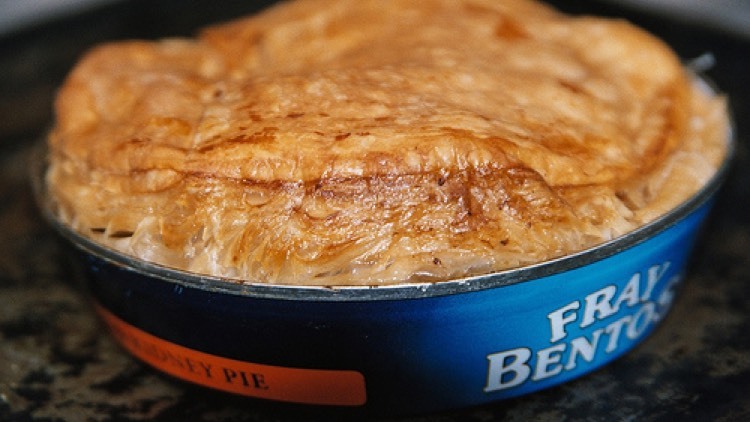 Just because Wendy likes a Fray Bentos, it doesn’t mean that she’s going to have that being served to all bartlett mitchell customers. It just means that when she’s had a long week and doesn’t feel like cooking, there’s something quite nice about that simple pie that you bake in the tin you bought it in. It may not be dinner party fayre, but it’s actually not that bad. We all have them. My list is quite long. I love a sausage and egg McMuffin and I actually look forward to the rare return of the McRIb and always get one when it’s back on the menu. I regularly use Bisto, I often use stock cubes to give flavours a boost, I think custard powder works pretty damn well, I quite like KFC and Dominoes, I use Old El Paso taco and fajita kits, I often use ready-made pasta sauce rather than tin tomatoes as the base for my sauce, I use far too much ketchup in general, I love brown sauce and yes, I like Fray Bentos pies too. Just because I wouldn’t advocate our chefs serving this stuff to our customers, I would never condemn someone for having it at home. In fact, some of my favourite food trends have stemmed from these guilty pleasures. With all of the work we have to put in to fancy “bistro” dishes, trendy international dishes and the ever present nod to the classic favourites, one of the most popular dishes we ever serve is a fish finger sandwich on white bread. Those fly out. Look at the new trends. It’s not Michelin stars leading the way, it’s that amazing burger van, the authentic fried chicken, creamy mac and cheese…. It’s that authentic, comforting food that brings you back to what your mother used to make or to a memory long forgotten. David James, for my 40th birthday, gave me a massive bag of American sweets and chocolate that I would have grown up with in Texas. Now, I received some wonderful gifts for that birthday and some that were really quite expensive, but I don’t think anything brought as much joy as that bag of sweets. I would almost revert to being a child again, snuggling up on the sofa in front of a movie with my wife, trying all the different sweets, many of which I hadn’t had since I was a kid in Texas. It would immediately remind me of moments in my childhood which I had forgotten. Taking my allowance to the local shop to buy a Charlston Chew and sitting in the parking lot with my best friend to eat it, as I just didn’t have the patience to wait till I got home. Sitting in the back seat of the car, having a competition with my sister to see which of us could fit the most Big League Chew in our mouths during a road trip to New Mexico. Eating an Atomic Fireball on a hike while we were camping in the Blue Ridge Mountains, it was so hot that I couldn’t eat it in one go but I didn’t want to litter in those beautiful woods, so I persevered, taking turns holding it gingerly between my thumb and index finger, letting my mouth cool down, then popping it back in for another minute or two, before my eyes started to water again and I had to take it back out. I guess that’s half of the appeal. Just like a song that transports you back to an earlier time, scent and taste are just as powerful emotional anchors. I’m not saying guilty pleasures are the future of food. I’m not saying a McRib is a culinary masterpiece but when I take a bite of one, I’m suddenly 10 years old again with my parents and my cousin on a trip to Six Flags Over Texas after having just taken a ride on that rickety old wooden roller coaster, the Judge Roy Scream. What else can do that for less than a fiver? I’m not saying that guilty pleasures are better, healthier or more interesting than making things from scratch, but with reasonable quality or are time savers that will do just fine if you’re in a pinch or just too tired to cook or go out. At the best, however, some of them are time machines that will actually take you on a welcome trip down memory lane and, for that, I say wave your fish finger in the air with pride.